Which are the most popular features of Streak? As a highly-customizable product (suited to your unique workflow), Streak can be used in a variety of ways. We've put together four of the most commonly used and favorited features. 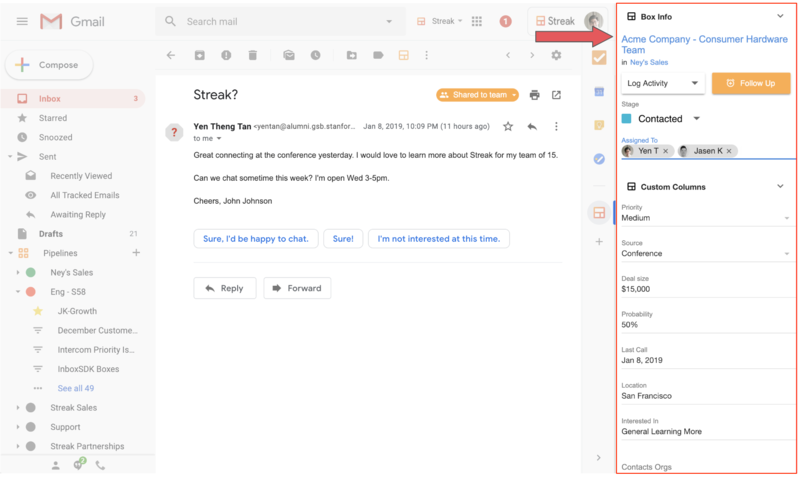 After you add an email to a box, the Streak sidebar will appear in Gmail. From here, you'll be able to update any and all information relating to this box. Just click on any field and start typing and editing. This sidebar will pop-up for any future emails on this thread. As a user, you'll be able to get context on the email and update your work without ever leaving the email thread. To add even more detail, click into the box name (in this case, "Acme Company - Consumer Hardware Team") to get into the Box view. In the sidebar, add contacts (we auto-suggest contacts to be added). Once added, Streak auto-enriches these contacts with any publicly available data. As a user, you'll enjoy the enriched contact data. 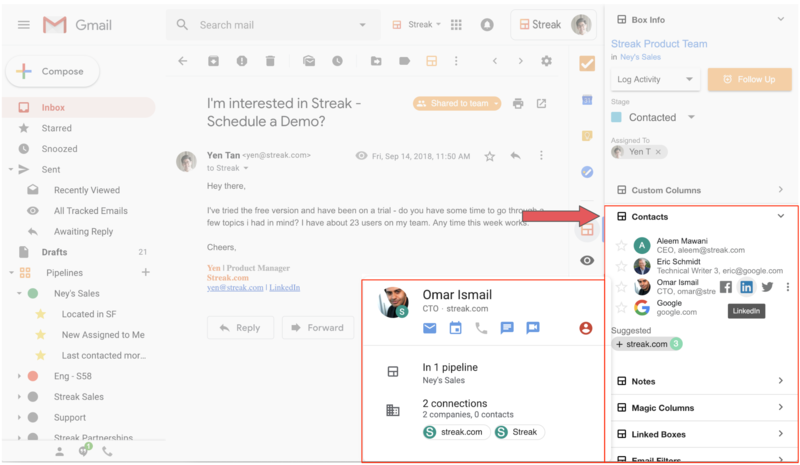 You could also email, schedule meetings, take notes, and even start a Google Hangouts with the contact right there from the sidebar. 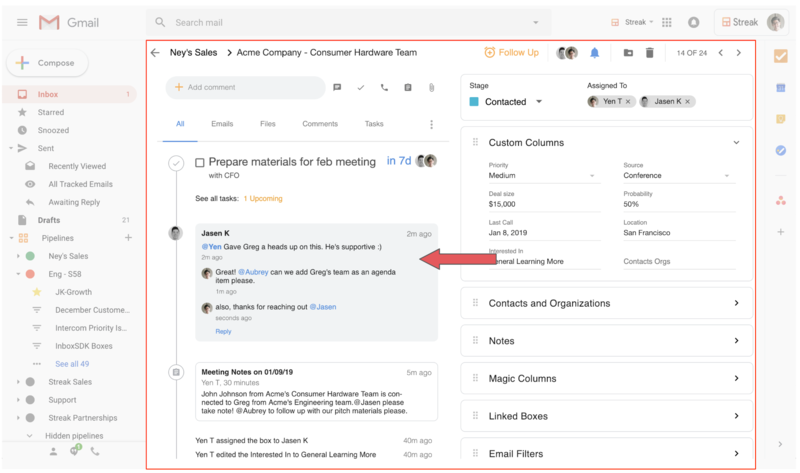 In a Box view, you can @mention your team members to notify them, add comments, reply to comments, add files, add call logs, add tasks with due-dates and reminders, and many more. You or your team can share any email by simply adding it to this Box. As a user, you'll be able to collaborate with your team on any given Box, all in Gmail! Saved Views allow you to see the most relevant information based on your Pipeline data. If you want to see leads that have not been contacted in 7 days, or opportunities that have been assigned to you, or projects that are above a certain deal size, or candidates in a certain geography, or ANY permutation of your Pipeline data, Saved Views let you visualize that instantly. 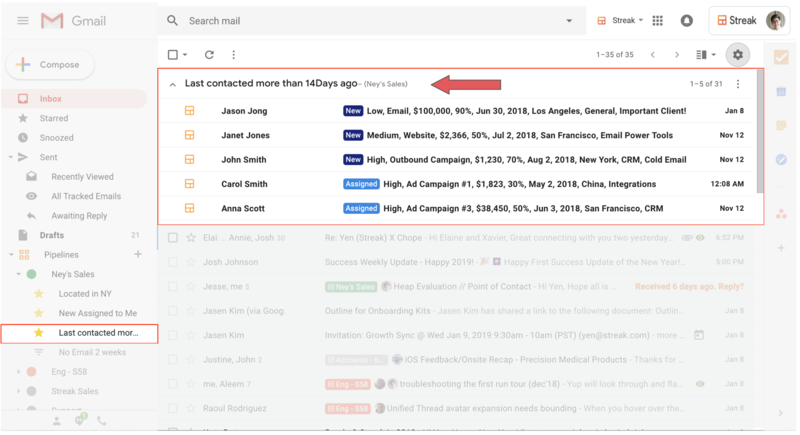 For Saved Views that you want a constant reminder of - for example of leads that have not been contacted recently - you can use Show In Inbox to ensure these are top-of-mind and take care of. Every time you log into Gmail, Boxes that fit the criteria will show up. As a user, you'll be able to visualize and surface any permutation of important data from your workflow, right in your inbox. We hope you'll be able to try these features out! Not sure how to set these up? If our support articles don't answer your questions, simply reach out to us!